Sharon Wildwind's first mystery series is the Elizabeth Pepperhawk/Avivah Rosen Viet Nam veteran series. 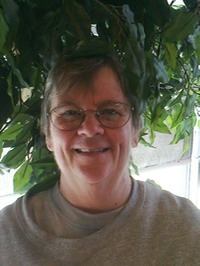 She also wrote a non-fiction book about her year as a nurse with the U.S. Army in Vietnam. Other works in progress include a mystery-romance series set in a nursing station in northern Alberta. She's also working on some plays. 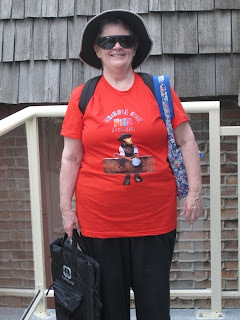 As a fiber and paper artist she designs and make clothes, costumes, quilts, book bags, tea cozies, greeting cards, decorated boxes, shrines, and non-traditional books. In case you missed Calgary news about a month ago, the city was under a state of emergency from June 21st to July 4th. 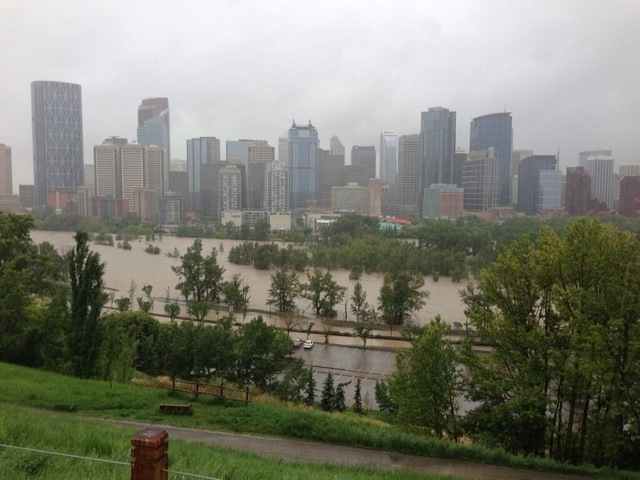 A combination of unusual weather patterns, flooded rivers in southern Alberta, including two in Calgary. Here is a photo of downtown Calgary from the Calgary Herald on June 21. See those trees that appear to be growing in the middle of the Bow River? That’s all that’s visible of Prince’s Island Park, named after Peter Anthony Prince, the founder of an early Calgary lumber mill. The Park hosts many local events, including the Calgary Folk MusicFestival, scheduled to happen five weeks from the day this photo was taken. The Festival not going ahead would be a disaster on a lot of levels, but for me it was intensely personal. I’d planned to celebrate a renewal and rebirth there this year. I went to hear a friend open a Saturday night concert at a local folk club. The audience was packed with older, grey-haired people like me. I thought, heavens, we folkies have been doing this for a long time. Like about 50 years for my generation. The first album I bought (with babysitting money) was Peter, Paul, and Mary: it had the cover with the brick wall behind them; Mary holding a bouquet; Peter and Paul with their guitars. We’re talking back in the day here. The opening verse went straight to my heart. It wasn’t just us oldsters in the audience. There were at least two younger generations in the room, growing up with music just as we had. But performers were passing. I ticked a list of voices forever silent, but that just depressed me, so I switched to ticking off other folk albums I’d bought, concerts I’d attended, festivals where I’d volunteered, parties — oh, yeah, parties—, musicians I’d met, and musicians I’d love to have met. What else did I have? I had a lifetime of listening to music and getting to know musicians. In addition to hosting the festival, Calgary is ripe with folk and live music clubs. 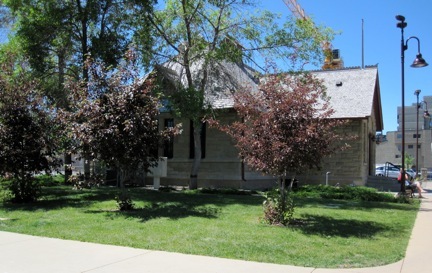 It didn’t seem fair to saddle an established club with murder and mayhem, so I created my own fictitious club, Green Flag Folk, which I housed it in a wonderful, historic building, that had been Calgary’s first sandstone school. Here’s the building in pre-flood days. Unfortunately, it was in the flood area, but it looked okay when I walked by it a couple of weeks after the waters went down. To run the club I created the Breland family; Sid, the Club founder and president; Jay-Jay, his cousin, who lived and worked in Nashville, but came to Calgary often; and Robbie, also a cousin, a no-nonsense woman who had a lifetime hold on being the Club’s volunteer coordinator. People trusted Robbie with secrets because she knew how to keep her mouth shut. All of those secrets had been stewing for a long time and one night they would boil over and a musician would die. For the title I chose Carrying the Blood, a line from one of Ian Tyson’s songs, The Steeldust Line. What I wanted to celebrate on Prince’s Island this July was that the first draft of Carrying the Blood is finished. What else did I have? I had another book in me; one I’d never imagined I’d write until that night in the folk club. Flood water receded. Mud and silt covered the island, threatening to kill the trees. Debris was everywhere. Buildings were damaged or destroyed. Electricity was out. City crews, along with Folk Festival and other volunteers, rallied. The call for volunteers was brutally honest. Volunteers had to be capable of working 12-hour shifts in a muggy, sodden, mosquito-laden environment; of shoveling mud and silt into wheelbarrows; and of pushing those wheelbarrows to the removal trucks. Still the volunteers came. Age and height prevented me from being one of them, but they had my thoughts and prayers. Sharon Wildwind is a Calgary, Alberta mystery writer. Her web site is www.wildwindauthor.com. She’s also on Google +, and tweets @sharww. This makes me so happy! I'll try to be patient while awaiting the pub date. 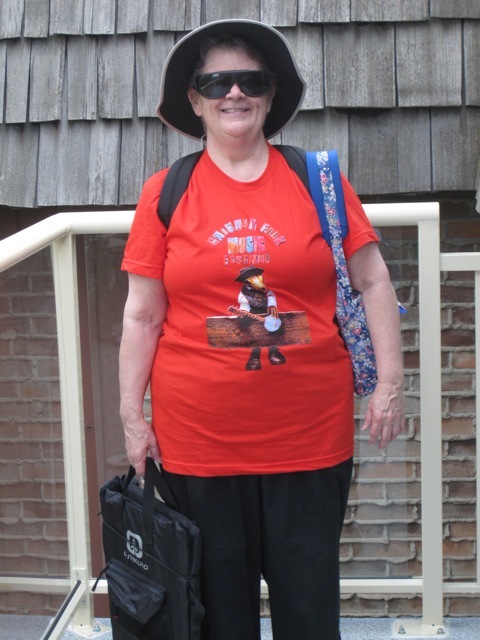 Welcome back to Meanderings and Muses, Sharon! Cannot WAIT to see what you'll have for us next. I'm glad to hear of a new book; I look forward to reading it. I hope Calgary has a good recovery. Thanks to Kaye for giving me a chance to celebrate publicly. It's nice to have other people be excited with me. Come to Calgary. We'll meet in front of Main Stage and enjoy some music. It is both amazing and heartwarming that Calgary will go on with the event. I do want to look for your books. I wish you the best with the newest.